Another season, another HCAA Championship for our Senior Girls Basketball team. The girls had an amazing run going 7-1 in the regular season. 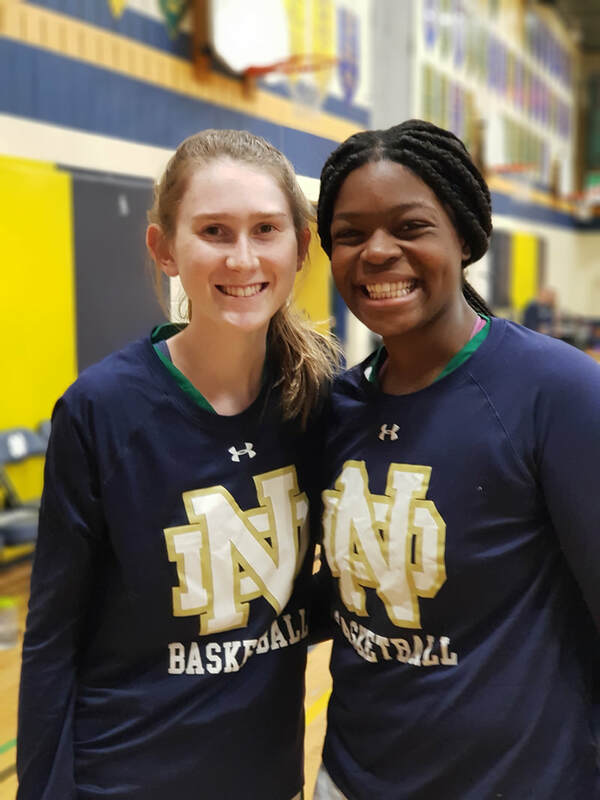 Notre Dame’s first game was on September 25th against Loyola and the girls came out strong winning the game 44-29, this would set the tone for the rest of the season. 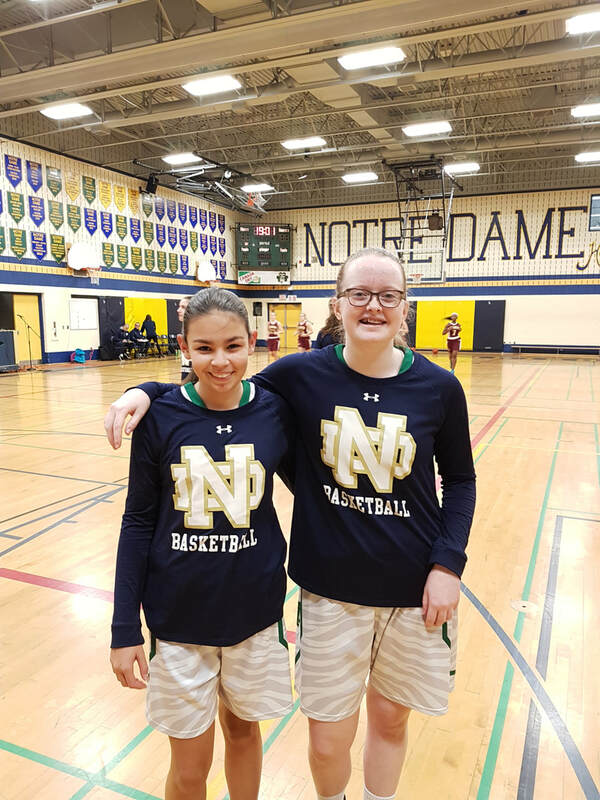 The girls highest score was 48-33 against Jean Vanier on October 11th, while their biggest score differential was 27 points against Assumption finishing off the game 45-18. The girls only lost once, to St. Thomas Aquinas, in the regular season by 2 points with the end score being 30-28. Thus, with the Senior Girls basketball team being 2nd in the standings, it was time for the playoffs. 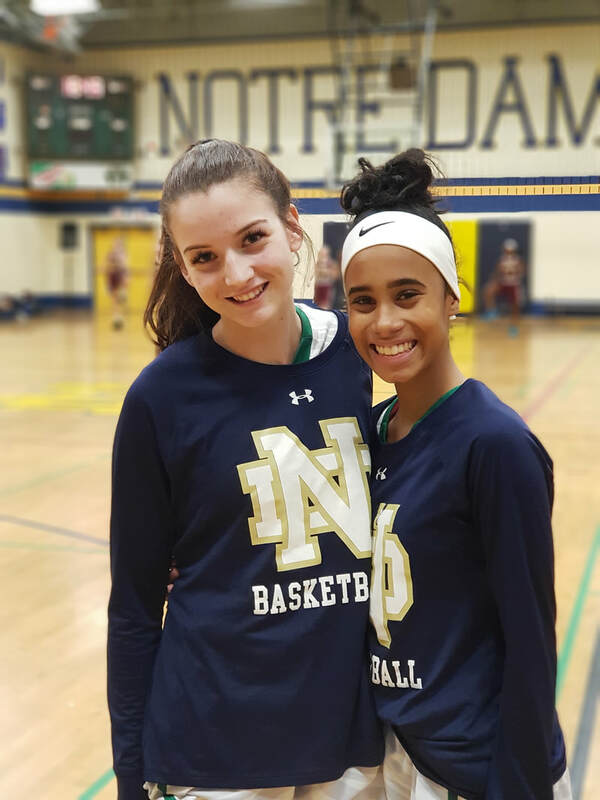 Notre Dame’s first playoff appearance (also known as the Quarter Finals) was against Bishop Reding at Notre Dame, which gave the girls a home court advantage. The girls pulled off a 47-21 victory, with throngs of the Notre Dame faithful cheering them on. Next the girls played in a Semifinal game, also at home in front of adoring fans, winning that game 41-28. Because of their HCAA win the girls were off to compete in a spot at OFSAA. 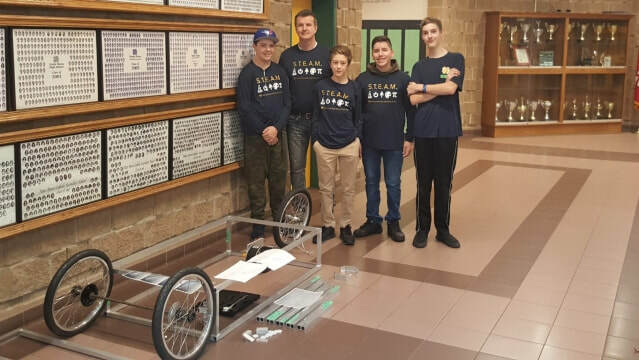 The team advanced to the GHAC Finals but unfortunately came up short against St. Mary's from Hamilton. We are still so proud of our Senior Girls Basketball team who won their 3rd consecutive HCAA title, a very impressive feat. ​The Junior Girls Basketball team went 4-4 in their regular season. Losing their first game to Loyola 26-23; Their highest score differential was 18 points against Jean Vanier winning the game 33-15. Though the girls started off rocky they fought hard during the season, making it to the playoffs. Their first playoff appearance was against Holy Trinity and the girls won that game 24-20. Next they were off to the Quarterfinals to face off against St Thomas Aquinas. The girls tried their hardest, but came up short losing 39-22. 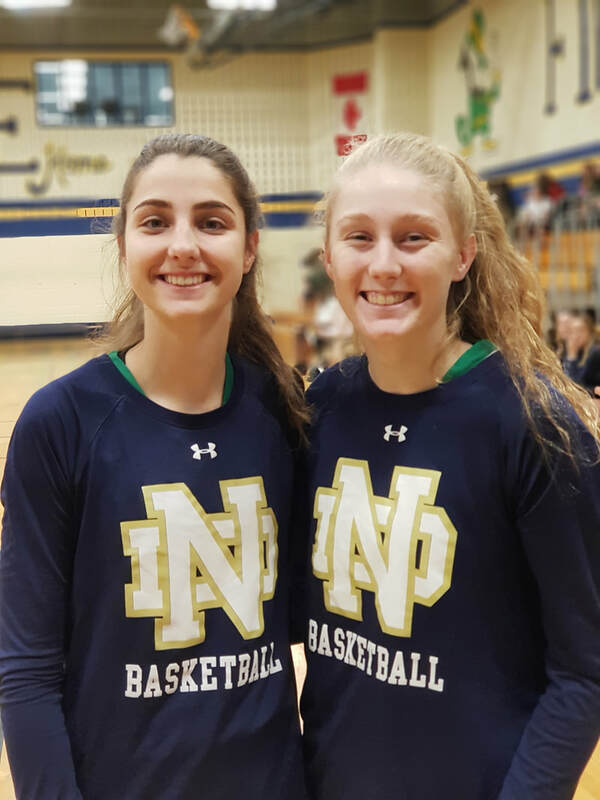 We are very proud of the girls for making the playoffs, the future of ND Basketball looks bright! S. Hi, my name is Shannon. I am the lead on the E-car project. I am in Grade 11. A. My name is Alton, I am the Grade 9 lead student. I love cars, which is why I joined [the E-car project]. S. And in Grade 12 we have George, along with Madelyn in Grade 11, and Evan in Grade 10, who are not here with us now. Q. How did you guys get involved with the E-car? A. Mr. Vicic contacted me and asked if I wanted to be the Grade 9 Lead Student, and I accepted. S. Same for me. He [Mr. Vicic] contacted me and asked if I wanted to be the Lead. Also, last year I went to the E-car competition at the University of Waterloo, and it was really fun. S. It doesn’t look like a lot right now. We have three wheels assembled. We have the majority of the design for our frame done, which has been done by Daniel [who was sitting at the computer behind us working away as this interview went on]. It looks really cool, it’s all been done on CAD Cam software. Q. Overall, what is the group’s hope or goals for the outcome of this project? A. To complete this car and hopefully race it at Waterloo in May. Q. How can the ND community get involved with this project and do you believe it is important for them to do so? S. So, you can get involved by joining our club, we meet Tuesdays and Thursdays after school in room 142. During our meetings we work on the car in different areas. For example there are some people today working on braking and steering, we also have a few people physically making the frame and others working on the design. There’s a lot of things for everyone. A. It’s fun, you make friends, and it’s just overall enjoyable. S. We also learn a lot of useful skills, especially if you want to go into Manufacturing Technology. There’s a lot of jobs out there that aren’t filled, and this is an opportunity to learn many job skills for that field. Q. How are the different areas of STEAM involved in this project? S. Science could be tied with our use of Tungsten and other elements. Tungsten is used for TIG welding, which is used to weld Aluminum. Other types of welding get too hot and would melt everything, whereas with TIG welding everything is melted in a specific (good) way, which is better demonstrated than explained. Advanced Manufacturing is the use of technologies and methodologies to better increase efficiencies in an engineering and machining environment. A. Wow I can’t believe you have that memorized. S. Mr Vicic told that to me twice, I remembered it this time. S. Math is really involved as well. There are a lot of numbers, like even just how long things need to be, because everything needs to match up or else it's just not going to work. There was even one day when I had all the numbers written down across my arm so I could keep everything right there. Q. How can students who are interested in Art get involved in the E-car? A. Art is involved in the creation of the body panels and the overall design of the car. S. Yeah, for the general design an artistic perspective is needed, and for the outer shell of our car will probably need to be painted at some point, which I think we want to get the art kids involved to help with. Q. Is there anything else that you’d like to add to this? A. Just that I’m so excited to see what's to come throughout the year. A. My name is Nino LaDuca and I am the President of a company called TechCon Automation and we are located in Burlington, Ontario. Q. What does TechCon do? A. We build robotic assembly equipment for industries that include automotive, aerospace, food and beverage, and general industry. Essentially, we employ engineers, machine builders, fabricators, welders, and electricians, and we typically design and build our own custom automation equipment. Q. How did you hear about our E-car project? A. Mr Vicic reached out to me a year ago and he was looking for a Co-op placement for one of his students, and so we had the opportunity to bring on two exceptional ND students. They both worked at TechCon for four months, one worked in the Applications Group, the other worked in the Programming Department. That lead to a relationship with [Mr.Vicic], and he told me about the project working on the electric vehicle. [TechCon] just completed a lot of work for Tesla down in the factory in Fremont, and I thought that this was a good opportunity to get involved and to participate in the project. Q. Why do you think it is important for people [in High School] to be involved in the areas of tech that TechCon focuses on? A. I’m a CPA by trade, and I remember growing up, my parents were focused on me going to school to get an education so that I could be a lawyer or a doctor. Now that I’m in the work force and I’m managing a company, I know that there’s such a shortage of skilled labour in the industry. I think that for far too long kids have gone into programs where they want to be part of that 'white collar' workforce, not realizing that the 'blue collar' workforce quite frankly has suffered. I think it’s such a great industry because you get to develop a lot of solutions for customers that have a significant amount of challenges out there. A lot of customers want to automate their processes, and there’s a lot of opportunities for [high school students] to get into robotic programming, PLC programming, engineering, design, and the trades that include electricians, machine building, welding. To me there’s such a shortage of labour in this industry and it’s such a great industry that more kids should give a change. Q. There’s been a big push recently in schools to allow kids to opportunity to explore the trades that you mentioned, so it’s interesting to see that the same is happening outside the walls of Notre Dame. A. Yeah, when I first got involved with this company I was in a finance role, and it was about two years until I entered more of a management role, and to my position now. I’ve gotten to travel the world, and there’s a lot of opportunities to work with so many companies, whether it’s automotive, aerospace, or others. To me when I walk into a huge plant like Tesla and I see a new Model 3 being built for the first time and see them coming off the line before they go into the market, there’s just something really interesting about that, and that’s what allows me to continue to have fun in this industry. Q. What inspired you to come into our school and contribute to the e car? Q. We have been so excited to be able to work with your contributions and to see the project expand throughout the year. A. We are equally excited! That tells me that there’s a lot of kids that are excited about this space and this program and that possibly one day when they’re done their university or college studies, they might approach a company like TechCon or someone else and come work in the industry. Q. Do you have anything else that you would like to add? A. I just can’t stress enough that kids should certainly give this trade a chance. It’s done great, I’ve seen a lot of young kids join our company. It can be stressful at times, but, again, you get so many opportunities to travel and to see parts of the world that they may not have otherwise seen. They are certainly learning every day, it’s never boring or the “same old same old”. MP PAM DAMOFF TOURS NOTRE DAME! On Monday, November 11, Notre Dame hosted a Town Hall in the Lecture Hall. Pam Damoff, our Member of Parliament for Oakville - North Burlington was our Special Guest Speaker, opening herself up to answer a variety of questions from the Students at Notre Dame. The Town Hall was open to many people in this school, including members of different clubs like STEAM and Student Council. Between all of these invitees, the Lecture Hall was packed to the brim by the time announcements were over and the presentation was set to begin. Ms. Damoff opened with a brief introduction of herself; She shared that politics was never part of her post-secondary plan, and that she attended Western University before pursuing a career in finance. In 2010, Ms. Damoff was elected to Oakville Town Council after running an unsuccessful campaign years before; She was reelected in 2014. In 2015, Ms. Damoff obtained her current position as a Member of Parliament, where she continues to sit today. Currently, Ms. Damoff is a part of two committees, the Standing Committee on the Status of Women, and the Standing Committee on Public Safety and National Security. After this brief “get to know me” session, the floor was open to anyone who had questions….and there were plenty. Questions ranged from topics of Indigenous issues, to STEAM topics, to questions regarding the legalization of Marijuana. One question was in regards to what is being done to increase Canada’s capacity for diagnosis and treatment of mental illness allowed Ms.Damoff to share some work that is being undertaken by the Public Safety committee that she sits on. Ms. Damoff outlined the fact that research has been conducted, and indications are that First Responders (and Emergency Responders in general) have incredibly high rates of mental health issues, a vast majority of which go unrecognized and untreated. She said that the Committee has put forth recommendations to help Emergency Workers receive the support they need, and to spread recognition of this issue in the hopes to increase awareness and decrease stigma. 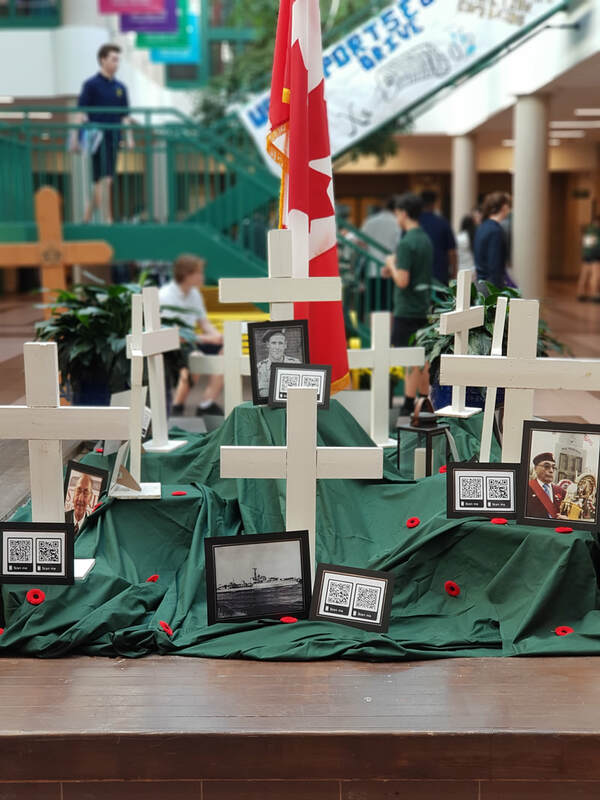 Unfortunately, the Town Hall was only booked for Period One, and though many students had more questions, the question and answer period had to be cut short. The Town Hall was completed with a thank you and presentation of the plaque to Ms. Damoff, before the Lecture Hall was cleared. This wasn’t the end of the visit yet, though. The STEAM Club took this as an opportunity to share the work that we have going on at the school, and took Ms. Damoff on a tour of the school, making sure to stop at each subject area on the way. Executive 'Subject Leads' waited in classrooms, excited to proudly share their projects, while the CEO's of the STEAM Club lead Ms. Damoff around the school. Comment est-ce que nous pouvons comprendre le courage énorme des soldats canadiens? Contre les millions de personnes qu'ils ont combattues. On doit se souvenir de ceux qui sont morts dans les guerres. Quelle était la justification pour cette violence ? Une des choses était de protéger notre liberté. En champ d'honneur les coquelicots fleurissent. La liberté de faire ce que vous voulez. Il est important de se rappeler d’où ça vient. C'est notre responsabilité de se souvenir. Ou au moins rappelons-nous ce qu'ils ont fait pour nous. Temps dans lesquels nous vivons est tout grâce à eux.